Out in the rustling cornfields a mysterious golden figure could be seen through the morning haze. She was wrapped in a newly refashioned scarf to take the chill off. I'm always inspired by my neighbor's cornfields and the rhythm of their growth and decay. In October their wispy dry husks glitter and glow as I pass them in the setting sun. I've been fantasizing about taking Goldie (my dress form muse) out for a walk in that field for weeks. Yesterday's freezing drizzle didn't deter us, and I'm so glad. The lack of sun actually made for lovely photos, even if it took me hours to warm up later on. 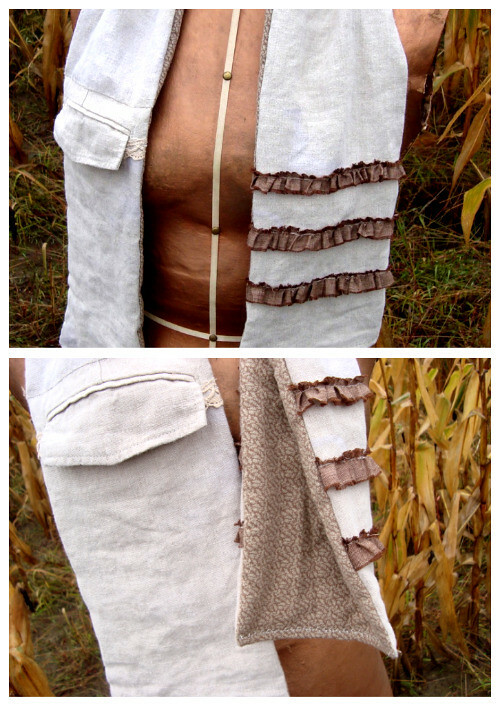 The Reinvention Scarf #2 is made form deconstructed linen clothing and features a recycled pocket just as #1 did... however, it utilizes it in a completely different way. I get a bit frustrated when scarves "un-drape" themselves from around my neck all on their own. I admire the styles that have a loop or opening to slide one end through to keep them secure. Using a frame and flap of a pre-existing back pocket (with the actual pocket cut out and removed) provides the perfect channel to pull one end through. I made that end a little extra fun with some raw edged brown linen ruffles. One of the rows of ruffles covered a seam where I had patched some extra fabric for length. You'd never know that seam was there. I had to remember to keep a slit open on the back side at the same spot as the outside pocket. The oatmeal linen was from a pair capris with lace trim (thrifted), and the back is a length of extremely soft flannel. It was leftover from some baby blanket making that happened around the time of my daughter's birth. Feels extra cozy around my neck just knowing the rest of it went into a receiving blanket. Another way to save and reuse pockets! I'd love to hear about any ways you've reused pockets or odd and ends from deconstructed clothing. Oh I love your repurposing!!! And I had a great browse through your new sponsors!!! My kids love making pocket bags... and we posted on "Pockets for Corduroy..." but actually they have been pockets for everything!!! Beautiful scarf. I love the brown ruffles. This is fabulous and soo Fallish too! The photo shoot in the corn field...amazingly creative!!! You got it goin' on girl!!! 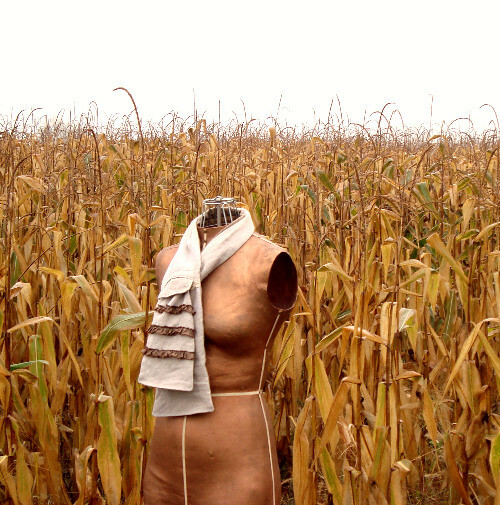 Vintage Girl- I think you can tell that the corn field was equally as fun as making the scarf! Setting up for that photo shoot must have been fun. Hauling a mannequin out to the field is a picture in itself. Great idea! 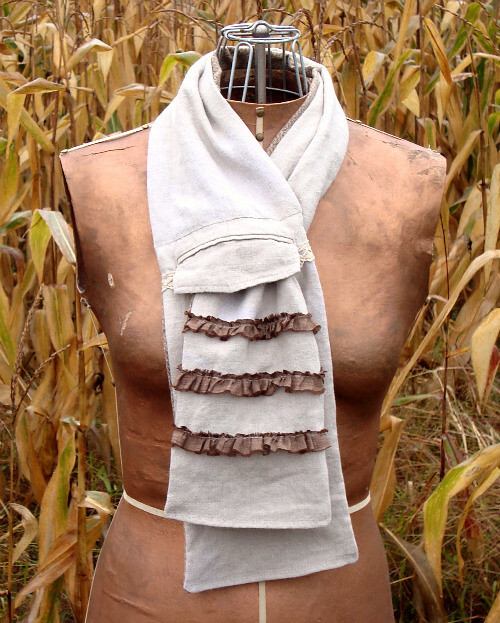 Charlotte- I love your scarf with the doily... such a delicately beautiful idea. Conny-luckily I didn't have to haul her very far and the crows thought she was there new buddy. Giddings- I hadn't planned on selling these, but if I do or make more like them I'll contact you. Thanks! saved a stash of old shirts so I can recreate some of your creations. Love it! Oh just gorgeous and I love how thoughtful you are about reusing fabrics and textiles. Love love love it Maya! And your photos are so beautiful.